ELLIJAY, Ga. – The Gilmer County Fire Department is continuing with changes to budget recommendations since last October. While discussions at that time had former Public Safety Director Tony Pritchett prioritizing a pumper truck higher on the list, the new Public Safety Director Keith Kucera, along with Fire Chief Daniel Kaufman, have urged the Commissioners to reconsider this budget priority. Instead of the truck, Kucera and Kaufman are asking the Board of Commissioners (BOC) to prioritize the upgrading and replacement of older turnout gear for firefighters. The new gear will be funded from the same money that was set for the truck. However, Board of Commissioner Chairman Charlie Paris states that there is expected to be a difference in the financial allocations. Therefore, an amendment will be needed. With 30 complete sets of gear, three vendors have been looked at. The cheapest vendor offers Lion Brand gear at $61,705.50. The department is also looking to replace 28 air packs for the firefighters to transition from 2216 PSI to 4500 PSI. Kaufman said this allows longer work times on scene as well as better compatibility with Ellijay’s Fire Department. The estimates for the 28 air packs with spare masks and cylinders, along with extras like voice amplifiers and larger batteries, totaled $215,740, according to Kaufman who spoke during the BOC April Meeting. Kaufman went on to say that the Fire Department wants to get to a point where they may rotate this gear among volunteer stations or other places of need. With this, the department would potentially only be looking to buy ten sets every 3 years instead of making large purchases like they are looking at now. Due to the age of the truck, Kucera said there is a sole source bid situation for repairs. That bid came in at $39,150. Paris questioned what the cost of replacing the truck completely could total. Kucera and Kaufman both said it would be around $500,000. While the Commissioners agreed on the severity of the need, allowing Paris and Chief Financial Officer Sandi Holden to look deeper into the budget and find the difference between the originally budgeted pumper truck and the need for the gear, air packs, and ladder truck repair. 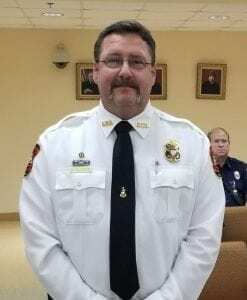 ELLIJAY, Ga. – A surprise even to him, he says, the Board of Commissioners officially announced Keith Kucera as the Public Safety Director of Gilmer County. FYN caught up with Kucera to ask him how he felt about moving from his months as Interim into the full-term position. He called it an honor to serve the citizens of the county in this position and looks forward to the coming months as he builds relations between the county and state and other local agencies. Kucera moves into the full term position alongside Daniel Kauffman as the Fire Chief of Gilmer. Kucera retired from military after 25 years of active duty, where he served in the U.S. Coast Guard, and moved to Ellijay where he says he never expected or looked to become a Director, yet when the opening came, he put forth his name and served in the interim. He lives here with his wife, Pamela. It is a move that many firefighters seem happy with. As reported in “BOC names full time Public Safety Director and Fire Chief,” many members of emergency services showed up at the commissioners meeting to show support for the direction the BOC was taking in their departments, though they didn’t know Kucera was being named as Director, FYN has come to understand that it had been internally announced before the meeting that Daniel Kauffman was taking the position of Fire Chief. According to Kucera, their support and the support of the Fire Chief is what will allow him to open up more to the duties of a Public Safety Director and allow the fire department to focus on what they do with a chief who can focus on that as well. This is something Gilmer Commission Chairman Charlie Paris has said before as he wanted to separate, at least, the fire chief position so as to not have one person pulled into too many directions and possibly detracting from the service offered to the department. Kucera said, “The Public Safety Division is going to be able to branch out to the other agencies within the county and build more of a coalition-type group within the county to serve the public better as a whole.” Kucera went on to note that some other benefits could include a better chance at obtaining and retaining grants from the federal and state governments as well as combining into a consolidated public safety group in times of need. Throughout the entire time speaking with him, Kucera never mentioned how he wanted to lead the department or the type of leadership he wanted to show. Instead, numerous times, he repeated that he was anxious to continue “serving with” the firefighters and emergency response workers of the county. ELLIJAY, Ga. – “Solidarity” was the word used by one fireman who spoke at Thursday’s, March 14, Commissioners Meeting. That show of solidarity included 15 members of public safety’s fire and ems divisions as the stood together to tell the BOC that they are happy with the direction and way the Public Safety Department is moving. To take that one step further, Gilmer County Board of Commissioners Chairman Charlie Paris skipped ahead on his agenda to return the favor by officially announcing Keith Kucera as the full-time Public Safety Director. Kucera has served as interim since February 12, 2019, and now begins his service as the full time Director, leaving the interim title behind. Kucera also released information to FYN that an official announcement has also been made about the full-time Fire Chief. Kucera was proud to announce Daniel Kauffman will be taking the position as Kucera tells FYN he comes from Ocala, Florida. Kucera said that Kauffman brings 30 years of fire service experience from Marion County in Florida as a District Chief and a Battalion Chief. He also has a Master’s Degree in Human Resources and a Bachelor’s Degree in Fire Science. Despite recent issues in the Fire Department, Paris stated to those present that they had no idea how much their public display meant to the Board. Further, those fire and ems staff present offered standing applause to the announcement of Kucera to the Director position during the meeting. ELLIJAY, Ga. – The Gilmer County Board of Commissioners opted for a refunding savings option from the Series 2014 Bond this month. Taking ‘Option A’ that was presented by Andrew Tritt, Managing Director at Stifel Financial Corp, will allow approximately $168,000 split between the remaining years. The savings would come to about $15,000 a year until the bonds are paid off. While Option B ultimately realizes only $128,000, according to Tritt’s presentation, it would defer 2019’s payment in an opportunity to see nearly an extra million dollars in 2019. However, County Chairman Charlie Paris pointed out that Option B would only defer that payment, meaning it takes that money from next year’s SPLOST. That million dollars is not extra and would put 2020’s SPLOST down a million dollars. Paris noted in the regular meeting that he didn’t think that moving the payment back was worth it. He said that even though the extra million would be great for 2019, it would hurt too much to lose those funds from 2020. Ultimately, the other Board members agreed with Paris as the vote came unanimously for ‘Option A’ to advertise the movement forward. ELLIJAY, Ga. – With rising tensions on the specific Parks and Recreation Board, the Board of Commissioners have officially dissolved the authority while simultaneously revisiting the Advisory Board Member Policies. That may be a little confusing to some as this entity is referred to as Authority and Advisory Board. In fact, part of the issue lies in that confusion as Gilmer County Commission Chairman Charlie Paris said he was shocked to find out just how much authority this “advisory board” had. With an early December Special Called Meeting, the Commissioners met to re-clarify the people they do and don’t want to serve on these advisory boards in order to avoid conflicts of interests. In addition, they sought to reset some of the make-up of these boards as they added a point for a liaison between them and the advisory boards. This practice is actually already been used without policy in some entities. Jim Smith, Director of Public Works, spoke at the meeting saying he was already a liaison for the Airport Advisory Board. Additionally, Mike Brumby, Director of Whitepath Golf Course, echoed the sentiment as he offered advice on how he has been the communications “hub” between the Golf Course and the Commissioners. They left in an addition to the policy which said, “Board Members may take part in their respective departments as a volunteer only with no supervisory role.” In order to keep the ability to volunteer while excluding them from any decision making or higher responsibilities that could conflict with there roles on the board. As discussion moved forward, the sentiment was agreed on by both Post Commissioners. However, when Paris made a motion to rescind the resolution and dissolve the Parks and Rec Board, a second did not immediately come. Post Commissioner Travis Crouch stated he didn’t want to second the motion because he wouldn’t be around to recreate the board later since December is his last meeting. Though Paris agreed he wanted to revisit the Board later, he did not want to make it a part of the same motion to dissolve it. Miller also stated he didn’t like the idea of a gap in the service of an advisory board, he did second the motion saying he understood the need to rescind the resolution. After the second, the Board did vote 3-0 for the motion. Member shall be appointed by the Board of Commissioners. Member cannot be a Department Head. Member cannot be a County employee. Member must be a resident of Gilmer County. Member must serve a specific term. Members shall not miss a majority of meetings in a year to remain on the Board. Attendance shall be taken at each meeting. Chairs shall be elected or re-elected each year by the Advisory Board. Boards shall have By-Laws, and those By-Laws shall be approved by the Board of Commissioners. Boards shall keep written minutes of all proceedings, shall be approved by the Advisory Board, and shall be maintained as public records. Boards shall report all proceedings in writing to the Board of Commissioners within 30 days of any meeting. All meetings shall be open to the public and duly advertised in accordance with the public meeting law. Board recommendations shall be presented to the Board of Commissioners in writing. Board members may take part in their respective department as a volunteer, only with no supervisory role. Item No. 16 institutes the creation of a liaison between the Advisory Board and the Board of Commissioners that could be a department head. ELLIJAY, Ga. – Splitting the board in two, the final vote after months of work came down 2-1 for approving the advertisement of the Gilmer County Budget. The $21,711,407 budget is in the advertisement phase right now and available for public comment and perusal. Officially, there will be a Public Hearing the first week in December alongside the Commissioner’s regular meetings. The county has already waded through several rising issues including a questioned raise for Post Commissioners, questions about elections in the Probate Judge’s Office, and issues with the Hotel/Motel split. They spent another hours-long meeting this month going over one of the two biggest issues, it seems, for this year. Requests in the Capital Budget are being strained and cut. Though these issues have occurred every budget session in recent years, an easier balanced Maintenance & Operations Budget (M&O) has drawn the extra attention to these needs. Some of the more extreme cuts focused on the larger budget departments and offices like the Sheriff, Road Department, and Fire/EMA. The road department saw cuts removing the chance for an Asphalt Spreader, a reduction in funding for a new lift station, and two trucks put on lease instead of outright purchases. Most of the county’s vehicle purchases across departments in the capital budget were either put on lease or straight cut from the budget. Fire/EMA lost funding for a replacement Rescue truck, EMA Headquarters, and mobile command centers as well as funding for turnout gear for employees. Amid discussions. Post Commissioner Travis Crouch said he had a hard time eliminating funding completely for the gear and was searching for a way to partially fund it over something else. Gilmer County Commission Chairman Charlie Paris noted to the other board members that it was done on the basis of a verbal priority list that Public Safety Director Tony Pritchett gave to the board during individual sessions. The M&O portion of the budget saw an increase in ammunition for the Sheriff’s Office, decreases in detention center salary raises (still receiving a slight increase overall), an increase to Road Striping for the Road Department, and an increase in Park & Recreation staffing among other things. In opposition, Paris said he felt the split is justified as it is. Several notes were made by Chamber President Paige Green as well as to the increases of the funding and increases in tourism the county has seen. Though she admitted fault in not living up to agreements made to details and information reported in her quarterly attendance to the commissioner meetings, she felt strongly that decreasing the Chamber’s funding from the Hotel/Motel tax would not only adversely affect the Chamber, but the county as a whole. As the third member of the board, Post Commissioner Dallas Miller seemed conflicted on the issue at first, agreeing with Crouch’s statements as to the struggling needs in other areas. Miller did state earlier in the meeting, separate from this issue, that he was pleased with what he saw as increased attention to the Road Department in the budget, a cause he has championed in recent years. Ultimately, considering the Hotel/Motel split and the numerous other portions of the county’s budget. Miller sided with Paris in a 2-1 vote to approve the budget for advertising. However, we do not know for sure if it was the Hotel/Motel split that pushed Crouch to the “no” vote as he declined to comment at this time. As the budget moves forward, it is now the citizens’ turn to question and comment on the budget in the coming month before the new year. Be sure to check out the full budget before these meetings.